Botulism pills. Conspiracy theories. What the government might have known and still won’t say about Lee Harvey Oswald. The release of thousands of records relating to the assassination of President John F. Kennedy hasn’t settled the best-known, real-life whodunit in American history. But the record offered riveting details of the way intelligence services operated at the time and are striving to keep some particulars a secret even now. Just a few hours after Lee Harvey Oswald was killed in Dallas, FBI Director J. Edgar Hoover dictated a memo saying the government needed to issue something “so we can convince the public” that Oswald killed President John F. Kennedy. 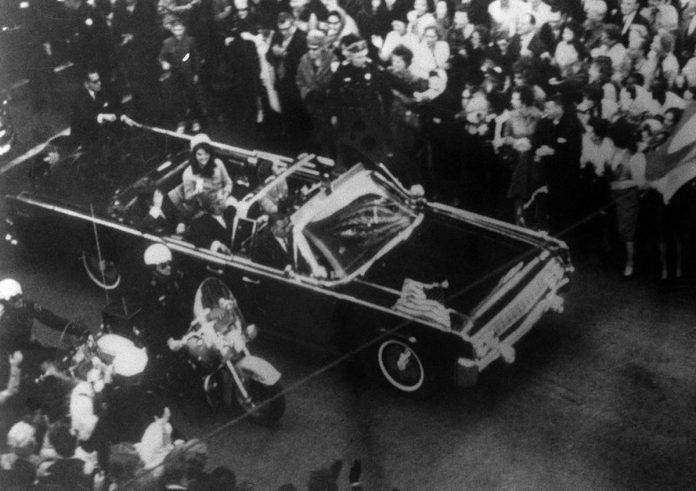 The memo was in the latest trove of Kennedy assassination files released late Thursday. The FBI director composed the memo on Nov. 24, 1963 — two days after Kennedy was killed and just hours after nightclub owner Jack Ruby fatally shot Oswald in the basement of the Dallas police station. Hoover laments how Kennedy’s successor, President Lyndon B. Johnson, was considering appointing a presidential commission to investigate the assassination. Hoover said he suggested that the FBI give an investigative report to the attorney general complete with photographs, laboratory work and other evidence. That report, he thought, could be given to Johnson and he could decide whether to make it public. “I felt this was better because there are several aspects which would complicate our foreign relations,” Hoover wrote. He said Oswald wrote a letter to the Soviet Embassy in Washington, which the FBI intercepted, read and resealed. Hoover said the letter had been addressed to the Soviet Embassy official “in charge of assassinations and similar activities on the part of the Soviet government. To have that drawn into a public hearing would muddy the waters internationally,” Hoover wrote. Besides, Hoover said, the letter was unrelated proof that Oswald committed the murder. Everyone has their theories, including even President Lyndon B. Johnson. According to one document released on Thursday, Johnson believed Kennedy was behind the assassination of the South Vietnamese president weeks before his death and that Kennedy’s murder was payback, the newly released documents say. “Where he got this idea from I don’t know,” U.S. Director of Central Intelligence Richard Helms said in a 1975 deposition. Diem and his brother were killed on Nov. 2, 1963 after a coup by South Vietnamese generals. “He murdered Diem and then he got it himself,” Johnson reportedly said. Kennedy’s position on Diem’s assassination is still debated, said Ken Hughes, a historian at the University of Virginia’s Miller Center. A month before Diem’s assassination, the south Vietnamese generals planning the coup told the CIA that they would overthrow the government if they could be assured that American aid would continue and Kennedy told them it would, Hughes said. But a dispute remains over whether Kennedy insisted that Diem go unharmed or whether the president left it up to the South Vietnamese generals to decide what to do, said Hughes, who is writing a book on the subject. One of the files that could shed light on that question is a CIA report on the U.S. government’s involvement in the Diem coup. The record was supposed to be released Thursday but was among the hundreds that Trump blocked from becoming public. The former Soviet Union’s intelligence agency allegedly claimed it had information tying Johnson to the assassination of President John F. Kennedy. The allegation was contained in long-secret files released Thursday. In a 1966 letter to a presidential assistant, Hoover wrote that an FBI source reported KGB officials claimed to have information in 1965 “purporting to indicate” Johnson had a role in the assassination. The source had “furnished reliable information in the past,” the letter states. The source said the KGB residency in New York received instructions from Moscow in September 1965 to “develop all possible information” on Johnson, who was considered “practically an unknown” to the Soviet government at the time. Those instructions contained the assertion that the KGB had information tying Johnson to an assassination plot, according to the source. Johnson has long been a focus of some conspiracy theorists, but no credible information has been revealed linking him to the assassination. A 1975 document described the CIA’s $150,000 offer to have Cuban leader Fidel Castro assassinated — but the mob insisted on taking the job for free. The underworld murder-for-hire contract was detailed in a summary of a May 1962 CIA briefing for then-Attorney General Robert Kennedy. By then, the Kennedy White House had launched its unsuccessful Bay of Pigs invasion of Cuba and several assassination attempts against Castro had failed. At least two efforts to kill Castro were made with CIA-supplied lethal pills and organized crime-made muscle in early 1961, according to the document. The CIA’s mob contacts included John Rosselli, a top lieutenant to Chicago mob boss Sam Giancana, who weren’t told but guessed the CIA was behind the offer. The pair, later victims of mob hits, said they want no part of any payment — but still, $11,000 in payments were made for expenses. Told later about “everything,” Kennedy was “unhappy, because at that time he felt he was making a very strong drive to try to get after the Mafia. The document was made public in 1997 and contained in an Associated Press report at that time. A British newspaper received an anonymous phone call about “big news” in the United States 25 minutes before President John F. Kennedy was shot in 1963, one file says. A batch of 2,800 declassified documents includes a Nov. 26, 1963 memo from the CIA to FBI director J. Edgar Hoover about a call received by the Cambridge News on Nov. 22, the day Kennedy was killed in Dallas, Texas. The memo from deputy CIA director James Angleton says the caller said “the Cambridge News reporter should call the American Embassy in London for some big news, and then hung up.” Anna Savva, a current Cambridge News reporter, said Friday there’s no record of the call. “We have nobody here who knows the name of the person who took the call,” she said. The memo was released by the U.S. National Archives in July. The phone call to the Cambridge News was first reported decades ago by Kennedy conspiracy theorist Michael Eddowes. In the 1980s, Eddowes, a British lawyer, claimed to have a CIA document mentioning the call. Eddowes, who died in 1992, wrote a book alleging that Kennedy’s assassin was not Lee Harvey Oswald but a Soviet impostor who took his identity. As a result of his efforts, the killer’s body was exhumed in 1981. An autopsy confirmed that it was Oswald. Analysis: What John F. Kennedy 2,800 Records Released Revealed. The records relating to the JFK assassination hasn’t settled the best-known whodunit.